👋 Hey NGOT readers! We just moved all of our OT content to CovalentCareers. 👍 Everything you need is still here, plus many new tools & resources. Enjoy! Want to ace your first occupational therapy job interview? 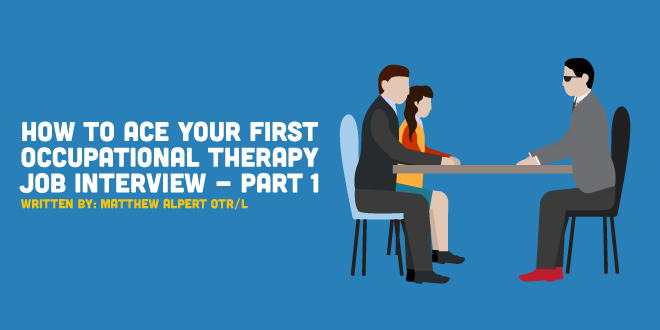 When preparing for your first occupational therapy interview, you must think of the interview as a chance to determine whether you're the right fit for a particular organization. They're interviewing you, and you're interviewing them. Today's article will cover some sample questions you may be asked, as well as some other strategies to ensure preparedness for your interview. It's always good to know the types of questions you might encounter during an interview. Interview questions vary widely within the OT field, so you'll want to research your facility before heading in for the interview. A mental health OT interview will differ significantly from one in a pediatric clinic or neuro rehab gym. If you're able to talk to therapists who work at similar facilities to the ones where you'll be interviewing, that is ideal. Pick their brains to discover what qualities and skills are most valued in those settings. Regardless of whether you have connections, though, make sure you learn everything you can about the treatment philosophy, clientele, documentation system and staff of the facility before you go in for the interview. Much of that can be taken care of with some savvy online sleuthing! Obviously, you can expect the typical "What are your strengths and weakness?" questions at any interview, but let's be serious: What are the real questions that might be asked? The NGOT writers asked some new grad OTs what questions they were asked while on their first occupational therapy interviews. I Failed a Physical Therapy Practical. It Made me a Better PT. Empowering healthcare professionals to find happiness in their careers through a commitment to innovation and conversation.